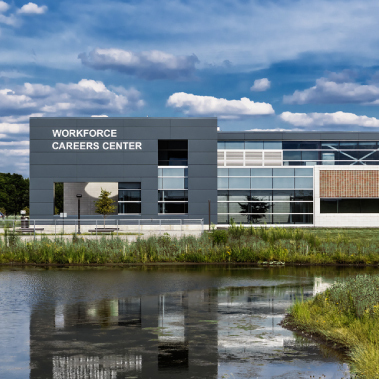 The Center for Contemporary Technology at Moraine Valley Community College was due for a significant renovation as a result of changing programmatic needs, under-utilization of existing space, and a disorientating circulation system. Additionally, several project goals included the creation of a revitalized front door for the facility, the development of engaging student life space, a strong visual connection between the facility and the Campus Green, and the development of a showcase for the college’s premier Center for Systems Security and Information Assurance. In order to address these design challenges, it became apparent that corridor spaces must be used for more than just circulation, but also as an integral component of the overall design strategy. Active student touch-down areas were created throughout the facility to allow students to plug in, connect and learn…alone or in groups. Views into program spaces and high-tech equipment enliven the building and display programs that previously fell neglected. The facility, which was once only frequented by students when a class had to be attended, is now buzzing with activity and is a true destination spot on campus.